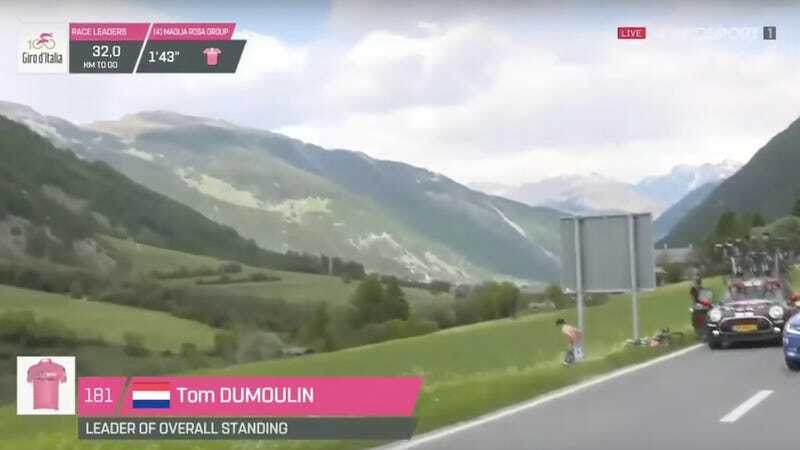 Tom Dumoulin abruptly pulled over during stage 16 of the Giro d’Italia today. The reason wasn’t clear, until he took off his gear and squatted to take a roadside crap. Dumoulin’s poop break sparked a minor controversy. In stage 15, he had slowed down the peloton after Nairo Quintana crashed, as it’s common to wait for riders after a wreck. After Dumoulin’s emergency, however, Ilnur Zakarin attacked to threaten the Dutchman’s lead. Is a crap the same as a crash? The question of our time. Vincenzo Nibali ended up winning the stage. Dumoulin is still the race leader, with Quintana 31 seconds behind him. This Mascot Is A Piece Of Poop. It&apos;s Poop.